Your body sports more hair than a gorilla. About 600 different species of bacteria are living in your mouth. Your head is full of holes. Back when you were a two-month-old embryo, you had a tail. Face it -- you are weird! All these wonderfully weird body features make us human. They also show that we're part of an animal kingdom whose members share a lot more than the same planet. This book tackles those weird questions that everyone's curious about but nobody seems able to answer. What does your appendix do? What exactly are goose bumps and why do we get them? Why can some people wiggle their ears? You Are Weird answers these questions plus many more, backing up answers with the latest scientific theories. 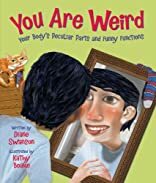 Take a guided tour around our oddball organs and freaky body functions that make us who we are -- wacky, wonderful and weird, weird, weird. About Kathy Boake (Illustrator) : Kathy Boake is a published illustrator of children's books. Published credits of Kathy Boake include You Are Weird: Your Body's Peculiar Parts and Funny Fun.